FANTASTIC BEASTS – THE CRIMES OF GRINDELWALD improves on the original, but is a strictly adult experience. 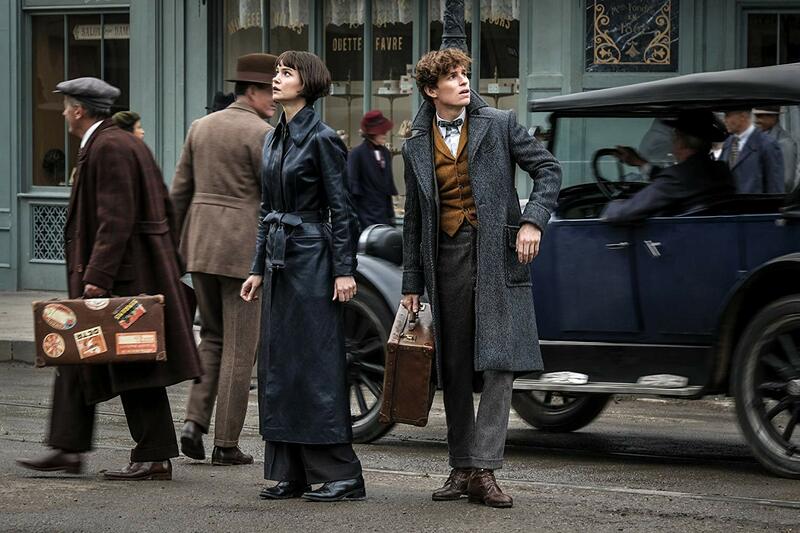 If you’re like me – and god I hope you aren’t because that would be weird – you weren’t exactly thrilled with Novelist JK Rowling’s 2016 prequel FANTASTIC BEASTS AND WHERE TO FIND THEM. Lacking the magic (no pun) of the Harry Potter universe, the film languished critically with drab casting, a muttering Eddie Redmayne and a story that seemed more like cash grab than glorious extension into the Potter-verse. Thus it’s no surprise that its sequel FANTASTIC BEASTS – THE CRIMES OF GRINDELWALD isn’t exactly burning up the pre-sale charts. And while it’s an improvement on the original, the follow-up suffers as both a dense and completely adult movie that is not intended at all for children. 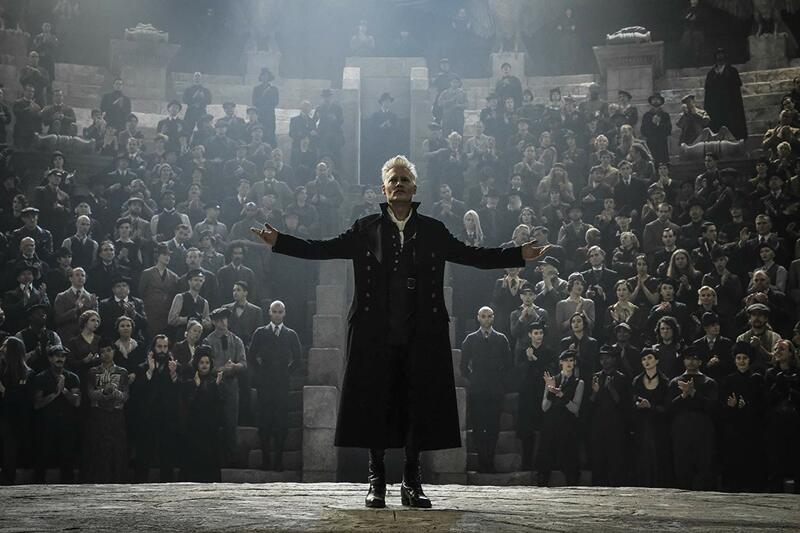 After a daring escape, the mastermind Grindelwald (Johnny Depp) begins to cement his following, taking over a lavish apartment and recruiting disenfranchised wizards to his cause. He wants Muggles removed from the chess board and thus hatches a daring plan: he will manipulate the powerful but tormented Credence (Ezra Miller) by exposing a dark family secret that has brought Credence to Paris. The British Ministry of Magic is hot on their trails, having failed to recruit Newt Scamander (Eddie Redmayne) to hunt down Credence. With his travel visa revoked, Newt is visited by his former Hogwarts teacher Albus Dumbledore (Jude Law) who implores him to find Credence before he either dies at the hands of the Ministry or joins Grindelwald. Newt has his own problems which has left his friendship with Tina (Katherine Waterston) at a crossroads. When their paths eventually cross (as the American Ministry is also following Grindelwald), Newt has already enlisted the help of his Muggle friend Jacob (Dan Fogler) and his girlfriend mind reader Queenie (Alison Sudol). But that might not be enough, forcing a violent showdown that sees Newt’s friends, the Ministry and his brother (Callum Turner) exposed to the deadly wrath of the terrorist mastermind Grindelwald. First off, GRINDELWALD is an entirely adult experience. Its PG-13 rating is well-earned, as within the first 10 minutes we witness (off-camera) the murder of a baby. There’s also a ton of adult death near the end of the film, which unlike the original is graphically displayed. If you’re reintroducing the Potter universe to your kids, you might want to think twice about exposing them to this kind of carnage. The film also suffers from a dense collection of myths and beasts, some of which actually live up the title. I think WB should have handed out lobby cards with the film, or included a “Previously, on FANTASTIC BEASTS” video segment. It’s a confusing experience overall, a concern similarly expressed by our test audience as they meandered out the theater. Judging by their tone, I think many of them were hoping for an improvement now that Rowling had returned to write the script. Unfortunately, the sheer amount of new characters (there are literally a dozen new minor ones) squeezed into GRINDELWALD are inconvenient distractions. There are mysterious holders of seemingly important information, a thinly veiled series of unappealing relationship stories, and a mythos that is never fully appreciated, expressed, or even integrated into the story. There’s also a side character whose timeline is causing a dust-up on the InterWebs, proving that Potter fans do their homework. GRINDELWALD is both immensely dense and paper thin. Returning Director David Yates – who’s been helming the Potter universe for seemingly forever – knows this universe all too well, and yet he seems unable to move the pieces around in a fully competent manner. There’s a lot to take in here, but Yates is still searching for the meaning behind BEASTS. It’s inevitable that this new universe will be compared to the Potter-verse, as that was about likable characters interacting in a fantastic (no pun) universe of creatures, dark alleys, while battling one of the most compelling baddies in film history. Little of that DNA has transferred to the Beast-verse, although the series has improved. Redmayne feels more in control of Scamander and actually brandishes the wand quite often in GRINDELWALD. But the usually fabulous Waterston is sidelined for much of this one, forced into a simple relationship struggle with Scamander. They have good chemistry, but there’s simply not enough of them and Jacob, which should comprise the new Potter trio. Instead of engaging in culturally timely discussions about Muggle/Wizard relations and the rule of dictators, they’re relegated to plot devices. Depp is (unfortunately) synonymous with playing odd characters, and Grindelwald has potential. But so long as Depp plays him as an evil version of Jack Sparrow – instead of his underappreciated performance in 2016’s BLACK MASS – he’s going to come under the microscope. Law is suddenly a box office draw who will also star in 2019’s CAPTAIN MARVEL, and here he’s quite good. I can’t wait to see him in future installments, if the remaining three movies are made. It’s clear that Rowling’s return to script is a sign of plugging up those leaks, but she’s also looking for the theme behind Newt’s universe. If it’s simply the pursuit of the Hitler-esque Grindelwald, her heroes could be starved for character development as they have been. Whether she can return the franchise to front-burner holiday viewing doesn’t seem likely for one. In a holiday season bereft of appealing titles, FANTASTIC BEASTS – THE CRIMES OF GRINDELWALD could have captured the imagination (and pockets) of moviegoers. Instead, it’s heavy on lore, thin on character development, and is definitely not for children. Regardless if you take the kids, I suggest a repeat viewing of the first film so you don’t walk out of this one wondering what you just experienced. Even with this prep, I think only the Potter apologists will enjoy it. That’s not the DNA of a four-category blockbuster, and certainly not what this franchise used to be. FANTASTIC BEASTS – THE CRIMES OF GRINDELWALD is rated PG-13 for some sequences of fantasy action and has runtime of 134 minutes.